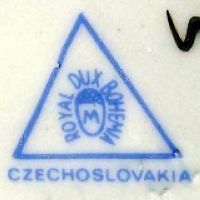 Porcelain production was introduced to Bohemia based on the efforts of specialists from Thuringia who had early recognized the potential of the area based on the rich deposits of raw materials. In the year 1794 the first Bohemian porcelain was produced in the town of Klösterle (today Klášterec) and further production facilities started to develop rapidly in the region around the former town of Carlsbad (today Karlovy Vary) as kaolin deposits could be found there. Similar favourable conditions for production existed around the town of Teplitz (today Teplice) in the form of large coal and kaolin deposits. After the construction of the railway line between the towns of Ústí and Most the transport of raw materials and products became much easier and while only three factories existed in the region of Teplice in the 1860's the number had already increased to eight just ten years later, rising to twelve in the 1880's - but at the end of the twentieth century, the region boasted an impressive number of nearly thirty factories. 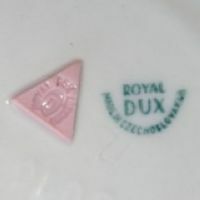 Among the first factories was the one in Dux (today Duchcov) that was founded in the year 1853 and after the first timid attempts to produce utility ceramic goods from raw materials mined in the closest surroundings, the factory was bought by the model expert Eduard Eichler from the small town of Parchen-Schelten and renamed accordingly. During 1862 Eduard Eichler also bought the small factory in Šelty near Ceská Lípa. The company experienced a period of prosperity and the goods produced here were mainly from terracota, faience and majolica. The designs based on products from Copenhagen, Worcester and Sevrés and were very successful and in 1878 the company was awarded the Silver Medal at the Paris exhibition. Following the death of Eduard Eichler in 1887, his widow Amalia Eichler continued to run the company until 1890. The factory was then purchased by her son-in-law, Wilhelm Hans. He signed responsible for larger expansion and modernization work as well as the introduction of soft-paste porcelain. Based on the ongoing success of the business it was then decided to transform it into a (stock) corporation under the name of Duxer Porzellanmanufaktur A.G. with main office in Berlin. 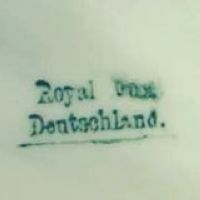 As the Fasold family had just died, the newly established Duxer Porzellanmanufaktur A.G. bought the porcelain factory ⇒Porzellanfabrik Fasold & Eichel in Blankenhain (Thuringia) and at the same time liquidated their own factory in Šelty. The factory now started to produce porcelain, apart from the traditional products. 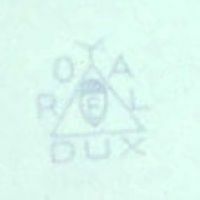 In 1900, the well known mark was introduced in its basic form. 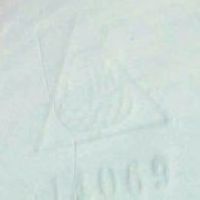 But at least three other marks exist, as you can see below; around 1904 the factory employed 400 workers. 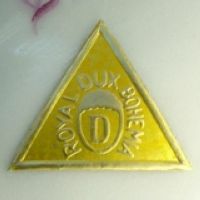 The mark best known today shows a pink coloured triangle and the inscription 'ROYAL DUX BOHEMIA' around an acorn (from the name Eichler, 'Eichel' means 'acorn'). 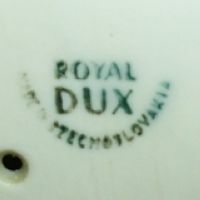 For the first years (until around 1918) the acorn had an 'E' for 'Eichler' in the middle, but it was later changed to a 'D' for 'Dux' whereas the 'M' can be found on items produced after 1953 when the company took over the former Porzellan- und Steinzeugfabirk Carl Spitz (owned by Dr. Adolf Fischer) in the former town of Brüx which 1945 had been renamed to Most. In the art nouveau period the company achieved a most remarkable success thanks to its modeller Alois Hampel. The factory was awarded the Grand Prix prize at the world exhibition in St. Louis in 1904, the silver medal at the exhibition in Milano in 1906 and the gold medal at the exhibition in Liberec. 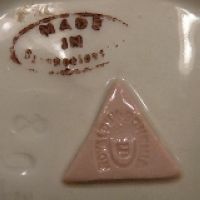 Some of the products introduced at that time are still produced up to this day. At that point, the company employed 500 workers and the factory had five round kilns and seventeen muffle kilns as well as its own steam and power plant. Sample store-houses and representatives in Berlin, Hamburg, Vienna, London, Amsterdam, Bologna, Paris, Stockholm and Madrid were a solid base for international trade as the products were mainly exported and the company had trade connections with all Europe, Russia, and even North America. This successful period was interrupted by the First World War, causing a short factory closure in 1914. Because of the specific character of the produced goods, the pre-war standard of production could not be maintained. Due to enormous financial difficulties, the factory in Blankenhain had to be sold to the German Carstens family at the end of 1917. In the period between the two World Wars the company did not succeed in achieving the same level of production as at the beginning of the century. The trade links had been destroyed during the war and could not be re-established and the necessary financial support for research and new designs was missing. When the world economic crisis broke out, the factory had to stop developing new lines. It was difficult enough to maintain the achieved standard. In spite of all these difficulties the company managed to preserve the character of its production. It continued to produce figurative and decorative porcelain based upon already existing successful and shapes. After World War II, most of the workers with German nationality were evacuated and replaced by settlers from further inland. The factory established its own apprentice training center and the State School of Ceramics in Teplice was re-opened. The cooperation with the High Industrial School of Art in Prague also largely contributed to the further development and helped to retain the enormous scope of production. Since the late fifties, the manufacture has slowly started to regain its lost position on the world market. The collection of Professor Jaroslav Ježek shown at the world exhibition EXPO 1958 in Brussels largely contributed to its success. During the years, the product range was further extended by realistic figurative motives and other products that are renowed for their smooth stylized forms in modern spirit, both in figurative and decorative porcelain. The variety and wide scope of the contemporary production program will please even the most demanding customer. The company strives to satisfy a maximum number of its customers by retaining a high artistic, aesthetic and technological standard of its production as depicted in the newer catalogs with figurative and decorative porcelain that is respected worldwide. 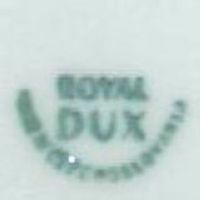 In 1992 the name of the factory in Duchcov was changed to Porcelánová Manufaktura Royal Dux Bohemia, A.S. and became an independent joint stock company again until 1997 when it became a member of the Czech Porcelain Group on the base of capital unification. Next to many others, one designer working for the company in Dux during the Eichler period was Otto Jarl. Used between 1900 and 1918, example #1. 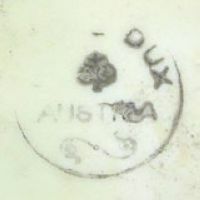 Used between 1900 and 1918, example #2. 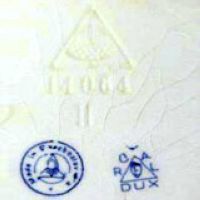 Used between 1900 and 1918, example #3. 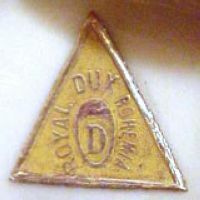 Used between 1900 and 1918, example #4. 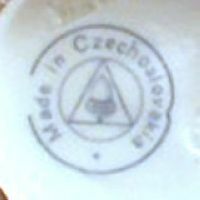 Used between 1900 and 1918, used in the interim period: 'E' but already marked 'MADE IN CZECHOSLOVAKIA'. 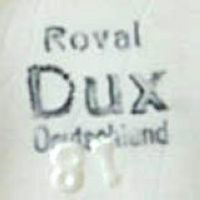 Used between 1904 and 1918, reads 'ROYAL DUX' over 'AUSTRIA', note the central element. 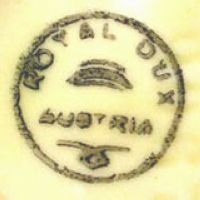 Used between 1904 and 1918, 'ROYAL DUX' over 'AUSTRIA', different central element. 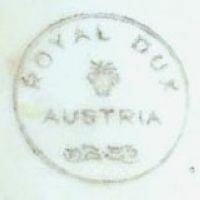 Used between 1904 and 1918, 'ROYAL DUX' over 'AUSTRIA', and yet another central element. 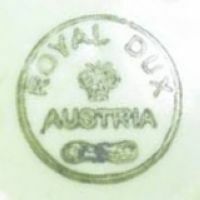 Used between 1904 and 1918, 'ROYAL DUX' over 'AUSTRIA', here a near perfect green example. 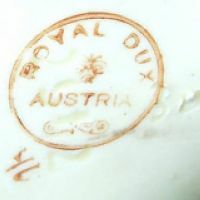 Used between 1904 and 1918, 'ROYAL DUX' over 'AUSTRIA', a red example. 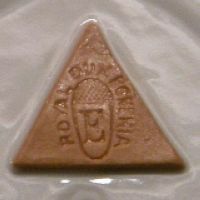 Used between 1912 and 1918, also with an 'E' in the acorn. 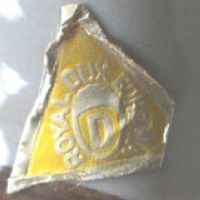 Used between 1912 and 1939. 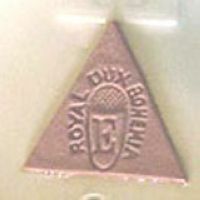 Used between 1918 and 1935. 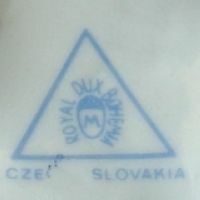 Used between 1918 and 1935, here with the addition 'CZECHOSLOVAKIA' impressed and stamped. 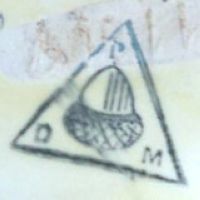 Used from 1918 onwards, blue version: acorn in triangle cornered by 'D P M' standing for 'Duxer Porzellan-Manufaktur'. 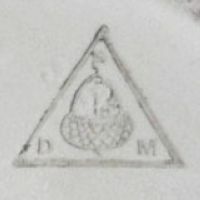 Used from 1918 onwards, black version: acorn in triangle cornered by 'D P M' standing for 'Duxer Porzellan-Manufaktur'. Used between 1918 and 1939, here in dark blue. Used between 1918 and 1939, here in medium blue. 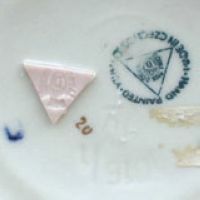 Used between 1918 and 1938, a hard to find combination with three marks. 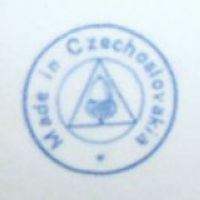 Mark type used between 1912 and 1918 with 'MADE IN AUSTRIA'; between 1918 and 1945 with 'MADE IN CZECHOSLOVAKIA'. 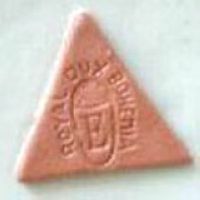 Same 1918-1945 version as before; please take note that it was often used without the pink triangle. Same as before, here together with the pink triangle. Same as before, here right next to each other. 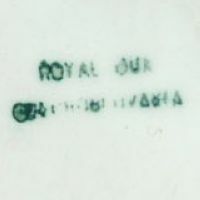 Used between 1918 and 1945, no letter in the acorn. 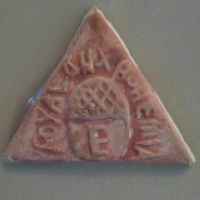 Used between 1938 and 1945, on products made during German occupation. 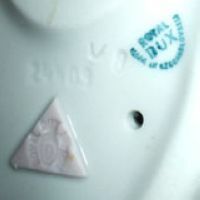 Used from 1953 onwards, the 'M' indicates this item was made in the factory located in Most. 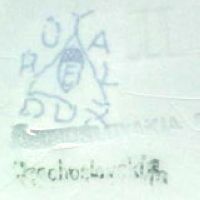 Same as before but an example which shows the mark transfer was not always correctly applied. 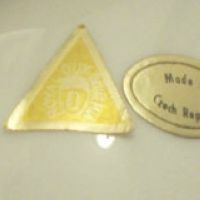 ... the sticker introduced in the 1990s. Note that this is also frequently found on fakes. Here an perfect version of the sticker introduced in the 1990s. And another one, this time with additional 'MADE IN CZECH REPUBLIC' sticker used from 1993 onwards. 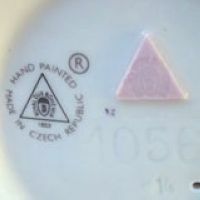 Used before 1993, the pink triangle combined with a print version showing 'HAND PAINTED, MADE IN CZECHOSLOVAKIA' around it. 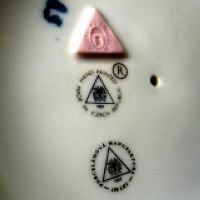 Used since 1993, pink triangle combined with print version showing 'HAND PAINTED, MADE IN CZECH REPUBLIC' with a ® mark. 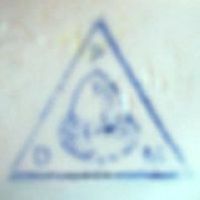 Another example of the mark used since 1993. 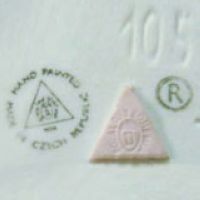 Used 2003, basic markings with additional '150 years' anniversary mark. 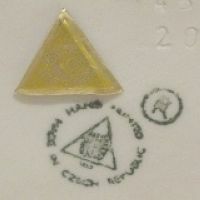 No date known, basic mark but with golden triangle instead of the usual pink one.